Over the years Shepley has grown to become one of the largest fabricators of Rehau windows and composite doors in the UK. The company has received a number of industry awards and in 2016, their solid sales growth together with excellent financial performance was recognised by both Plimsoll and the London Stock Exchange Group; receiving a Plimsoll Outstanding Company of 2016 award, and being named as one of the top 1000 companies to inspire Britain has placed a seal of excellence on the company. From their company headquarters and manufacturing base in Dukinfield, near Manchester, Shepley supplies its high quality products to a nationwide customer base of commercial and trade installers. In 2016, as well as winning awards the company’s continued success also necessitated an increase in its manufacturing capability. The decision was taken to expand into additional factory space, just around the corner, aptly named Shepley 2. As director Tony Fry explained: “To satisfy the growing demand for our products we knew we had to increase our production space, but we also recognised the need to invest in state-of-the-art machinery to enable us to maintain our competitive edge.” Although Shepley produces doors based on a range of composite blanks, the doors leaving the factory effectively represent an almost infinite range of bespoke designs. 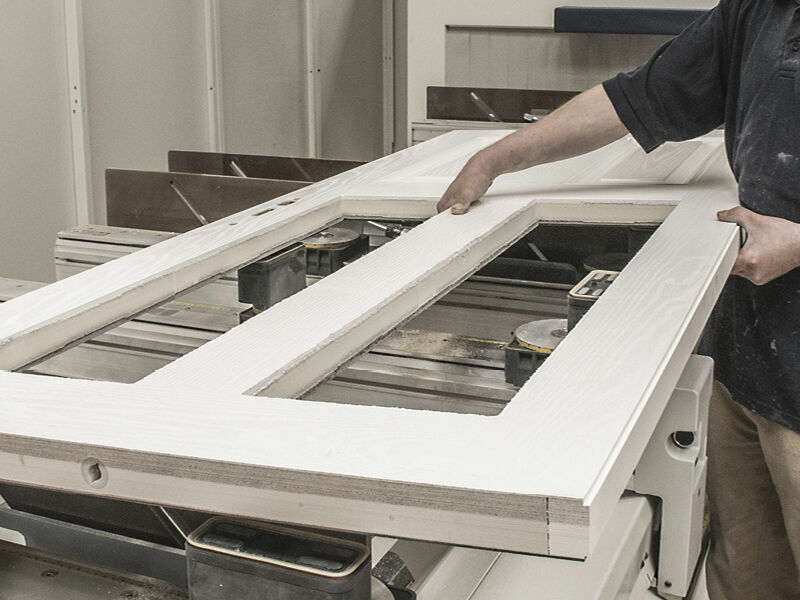 Orders for composite doors have to be processed as quickly as possible, and each order has a unique set of customer requirements for door furniture, as well as shape, size and position of glazing and letterbox apertures – so batch producing doors of the same design is not an option. 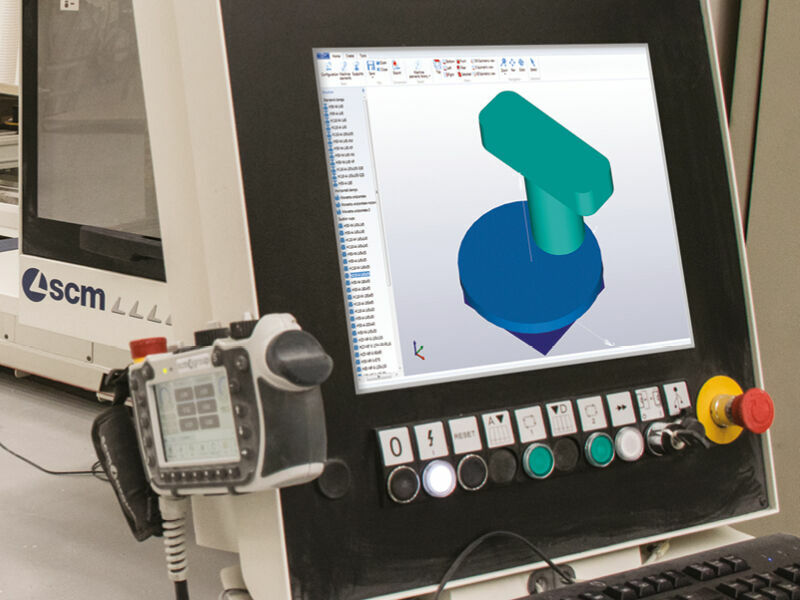 Along with fellow director Tim Walker, Tony Fry had researched the options available and they agreed that a CNC machining centre was what they needed. “We looked at the major manufacturers and we realised that SCM are the market leaders for CNC in the composite door market,” says Tony, “and we wanted a reliable machine, that would be easily maintained by the manufacturer, and where downtime was minimal.” To figure out which of the wide range of CNC models and options available from SCM Group would be right for Shepley, Tony met with SCM’s area sales manager, Lee Gibson. After meeting with Tony to assess the company’s requirements, Lee Gibson submitted a proposal to supply and install an SCM Accord 25 FX with specifications tailored to handle Shepley’s production criteria. The Accord 25 FX is designed specifically to fulfil the demanding requirements of small to medium-sized workshops, and the high-tech performance with intuitive, user-friendly operation, provides the flexibility that Shepley demanded. The Accord 25 FX can be specified in a wide range of standard working areas up to a maximum of 6360mm x 1680mm, with the mobile gantry allowing precision machining across the entire bed. Shepley opted for an ‘X-Y’ machining area of 3680mm x 1380mm, equipped with 6 aluminium support bars which are manually and independently positioned along the ‘X’ axis – sliding on two ground side guides with recirculating ball bearings. Door blanks are held in position with a combination of adjustable suction cups that are positioned and fixed on the support bars to suit the specific door design being machined. The machining head, with 3 interpolating axes, is fixed directly to the mobile gantry and equipped with a 12kW ‘high speed’ electrospindle, capable of rotation speeds from 600 to 24,000rpm, and a quick release HSK-63F tool holder. 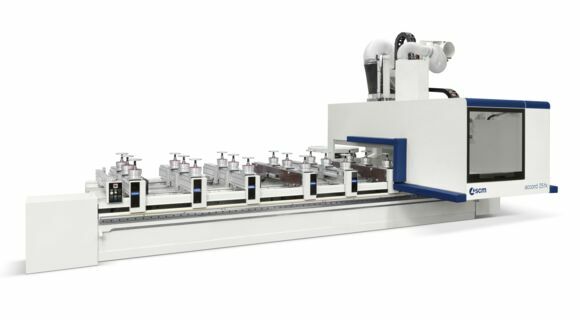 In addition, the Accord 25 FX installed at Shepley is equipped with a horizontal routing unit which machines lock grooves on the front edge and seats for hinges on the reverse edge. Shepley’s specification also included a ‘TecPad’ – a handheld 7” touch screen remote control unit which provides truly mobile control of electrospindle rotation speed and speed of axes adjustment – allowing constant monitoring of progress throughout machining operations. Operator safety at Shepley is ensured by the installation of horizontal photocells, fitted around the machine perimeter, which cut machine speed to from to 25m/min if the operator steps within a metre of the machine.